A very special 1996 Royal Hawaiian Mint Silver Proof Set was repeatedly ignored by collectors at an auction website. I have to admit, I also ignored the contents of the set, however I have been monitoring the set’s price as the seller was lowering its price on each auction re-listing. There were subtle hints in the listing’s description if you read it carefully. Over this past weekend I made the connection and pounced on this very special 1996 Royal Hawaiian Mint Silver Proof Set and became its new owner. What makes this set very special? These are rather high mintages for RHM (for the entire set and individual coins). 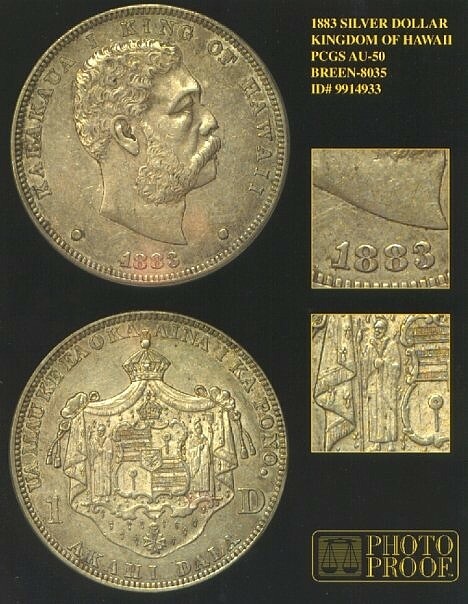 1997 King Kalakaua Hapalua Dala ½ oz. (documented mintage 88 and has engraved serial number). This is a specimen without an engraved serial number. As you can see, this 1996 holder holds non-1996 dated specimens. This is a significant error. As pointed out in the bold and underlined text, four specimens are undocumented and are either pattern coins or low mintage test strike coins. The RHM publically available mintage information have undocumented mintages for four of the five coins. It is also highly unlikely someone tampered with the sealed set and replaced them with rarities. Rarities? Here is my analysis of the coins. 1998 King Kamehameha Sovereign Akahi Dala 1 oz – This is the first example of the date and Akahi Dala design I have seen. The dated obverse die was later paired with the 1998 Hawaii Convention reverse design. 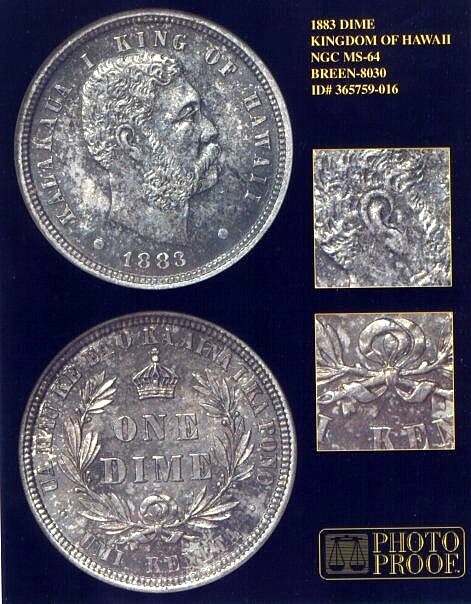 The dated obverse die was also paired with the $10 Dala reverse design, thus creating X# MB154 (mintage 30). 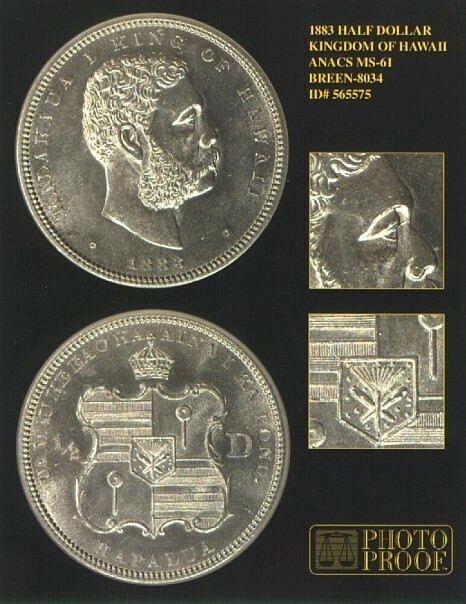 The 1998 King Kamehameha Sovereign Akahi Dala may just be an unique coin. 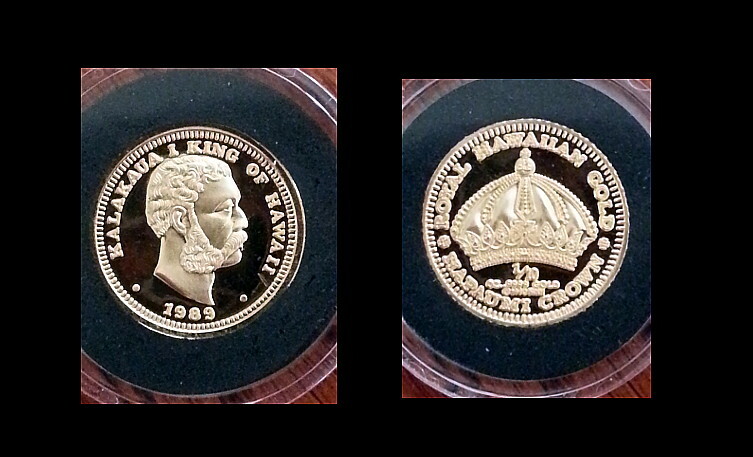 1997 King Kalakaua Hapalua Dala ½ oz – This is the first example I have seen of an un-serialized version of this coin. RHM documentation (COA) indicates there are 88 specimens with an engraved serial number on the reverse. This may be the only one without a serial number, thus making it an unique un-serialized version specimen. 1997 Queen Liliuokalani Hapaumi Dala 1/10 oz – This is the first 1997 dated silver specimen I have seen and should be elevated key coin for the Queen Liliuokalani series collector. 1997 Princess Kaiulani Hapaiwakalua Dala 1/20 oz – This is the first 1997 dated silver specimen I have seen and should be elevated as a key coin for the Princess Kaiulani series collector. This error assembled 1996 Royal Hawaiian Silver Proof Set is serial numbered 0754. Pictures are forth coming once I have received the set. Are there more sets like this out there? My collection also included several un-certified Hawaii Statehood medals. 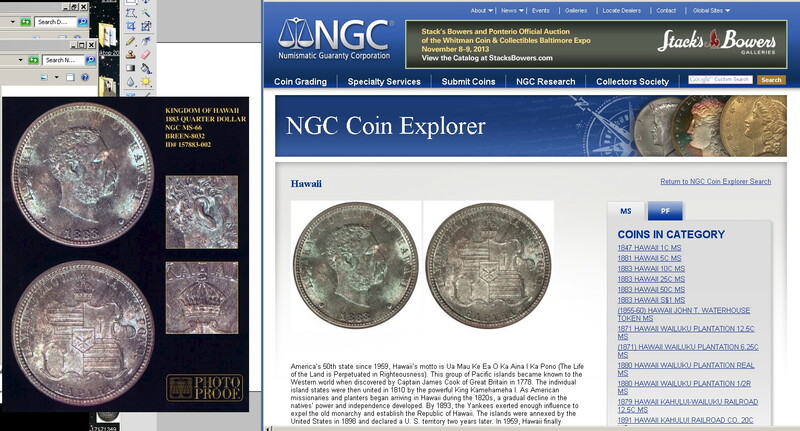 I previously owned the current plate coin now used at the Hawaii lop level web page at NGC. I ordered two PhotoProofs. One to held with the coin and the other locked up for insurance purposes. While working on my Masters degree at Johns Hopkins University, I unloaded most of my collection as it sat idle and the funds were more productive toward my education (I also did that with my Bachelors degree). When I inspect a coin, I look at it as if it is a new specimen. I identify anything that is out of the ordinary in its physical attributes. I then refer to its reference listing (guidebook or catalog) to place a judgment on purchasing the coin. I did this on a coin a few minutes ago and could not believe no one else caught the significance of this coin on eBay. So I purchased it…. The coin is a 1994 Princess Victoria Kaiulani Dala. Yes, it looks like an ordinary silver proof 1994 Princess Kaiulani Dala. I spotted something unusual and needed verification. I reviewed the publicly available Royal Hawaiian Mint’s catalog and immediately purchased the coin. There is an error in the publicly available Royal Hawaiian Mint’s information. The error is somewhat significant as a new Kaiulani variety is now correctly identified. The error with the RHM catalog is that the reverse is identified as a “Princess Dala”. The specimen I purchases has an “Akahi Dala” reverse. At first I believed it was a mule. 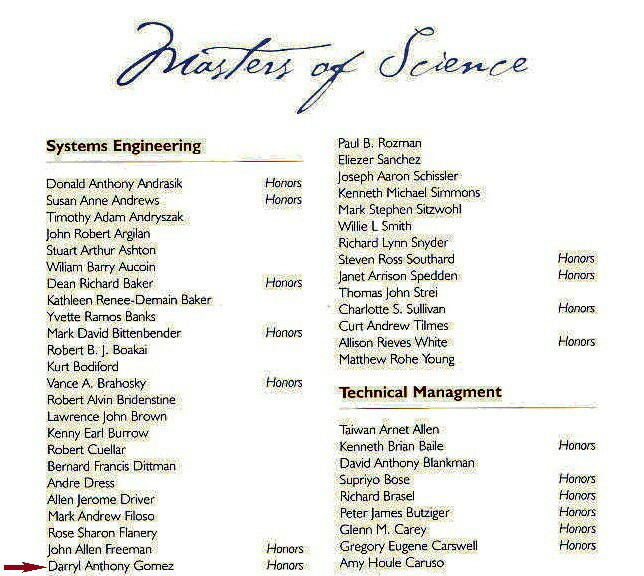 But if you read the RHM’s catalog carefully. Two rows above the 1994 Kaiulani Dala listing you can see what RHM did. They also used similar reverses and called it a “Hawaii Dala” and “Aloha Dala”. So what does this means? The 1994 Princess Kaiulani Dala has an”Akahi Dala” variety and a “Princess Dala” variety. If you inspect the 1994 Kaiulani Gold & Silver set you will see a “Princess Dala” reverse. What does this mean? 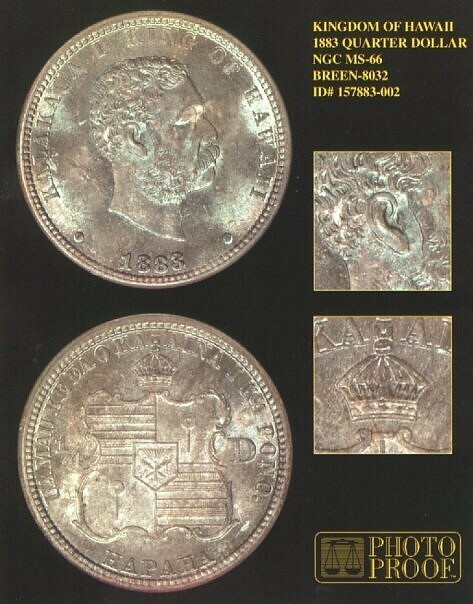 RHM indicates a total mintage of the 1994 Princess Kaiulani “Princess Dala” is 1,620, in reality its 950. 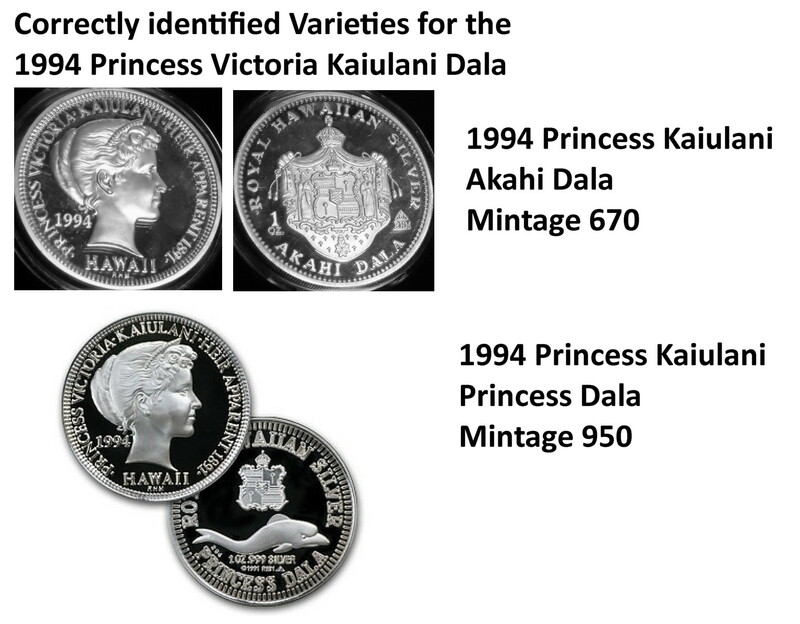 The 1994 Princess Kaiulani “Akahi Dala” mintage is 670. Both mintages must be separated as they are different coins. 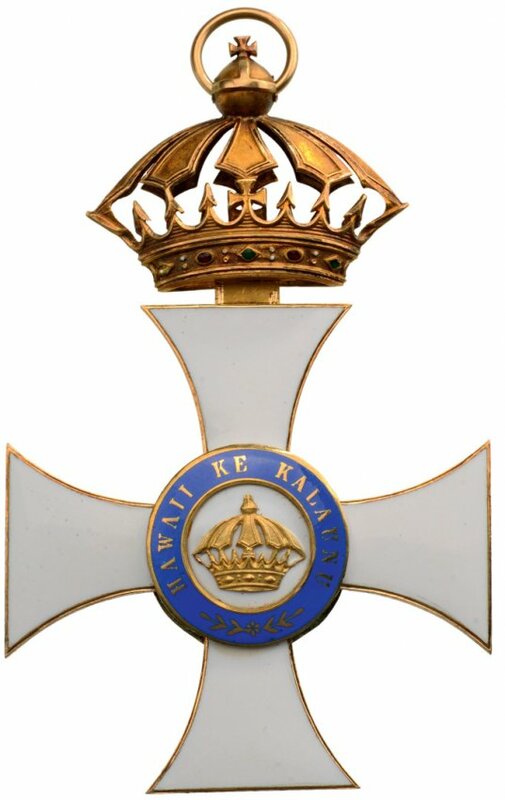 The 1994 Princess Kaiulani Akahi Dala with COA no. 1370 was used to identify the Akahi Dala variety. Worked on visual appeal of the book. In progress sample is below. Please click to enlarge.